The last few years have been a bit difficult for me, and I have felt very disconnected many times - disconnected from myself, disconnected from others, disconnected from my art, and disconnected from my job. As such, I haven't been happy with the direction of my life lately. I have felt stuck, tired, and frustrated. I have felt run down and closed off, but I am ready for a change - ready to reconnect - ready to step out and open myself again. So, I am setting out to do just that in the New Year, and I have set a mission for the Journal Fodder Junkies. It’s not a new mission. Actually it’s the mission that we have been on since we began offering workshops all those years ago. I have just finally given it voice. The mission of the Journal Fodder Junkies is to help others connect with their creativity and find their authentic artistic voices. It’s a simple mission, but I have lost sight of it over the years. I want to bring it to the forefront of everything that I do. It was the reason that I started this blog more than seven years ago. It’s why we wrote our two books, and it’s why we continue to offer presentations, seminars, and workshops. But over the last few years, I know that I have lost sight of that simple mission, and have allowed myself to be dragged down a bit. Recently, my focus has been on figuring out a way to to make enough money doing what I love to do so that I could step away from my job as a public school art teacher. I love teaching workshops, sharing my art and process, and connecting to people through my artistic journey, but I have been diverting my energy away from my true goal of connecting with others to trying to get a sustainable business going. Everything has suffered. I have been focused so much on making a living that I have forgotten to make a life. With the New Year looming, it seems like a perfect time to set my intentions back on track, and forget about the monetary and business elements. I want to focus again on sharing and connecting. So, in that vein I wanted to share something that I made several years ago, and some people may already have this. I want to share a piece of my art that I made four years ago that went along with my rules for making art. You can read my original post of Eric’s Rules here. Soon, I’ll have to share my updated rules. Please feel free to download the image above. Print it if you like, and hang it up. Or maybe glue it into your journal, and please share it with others. For a little over a year, I have been working on my Home series. It began with a painting that I created by projecting maps of the various places I have lived and called home. I then proceeded to create another painting using all the places that my wife has lived and called home. Other paintings in the series have sprung from layering different combinations of these two painting. For my latest paintings, I wanted to work on a bit of a larger scale and to take the work a step further. Instead of working on paper or canvas, I decided to work on two 22"x30" panels that I had made over the summer using wood and masonite. I originally intended on mounting some works on paper onto these, but I changed my mind and decided to gesso them. Once the gesso dried, I used Golden High Flow Acrylic and painted the pieces with a light blue. Up until now, I have left the background white, but I wanted to try working on a slick, acrylic surface other than white. Once the light blue was dry, I projected a variety of locations onto the panels. I used several clamps to clamp the pieces to the table and to one another. For the locations, I used the places that my parents and my in-laws have called home, and I traced all the roads and highways in pencil. The image above shows a portion of Washington, PA where my parents lived when they were first married. I'm in the process of creating the initial web using a pink I mixed up using the Golden High Flow Acrylics. 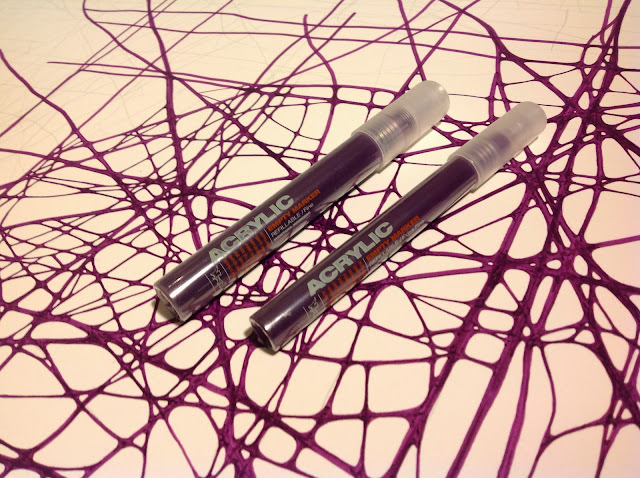 I love using this paint in Montana Paint Markers because it gives me such better control of the paint. It's a slow process of converting the pencil lines into the web, but I have one panel almost finished. It'll take some time to complete the pink with all the tightly knit lines and spaces. I do like how the accumulation of marks from the various roads build up into an organic structure. But this is just the first layer. Next, I'll project more locations, or I'll project portions of other Home paintings to create at least three different layers of webs. I can't wait to see how this diptych turns out. For more information how this series came about, see this post from November. Today, I hung artwork up at Old Ox Brewery in Ashburn, VA for an exhibit set up by the Loudoun Arts Council. I claimed a small wall in the brewery to showcase nine pieces including three pieces from my Home series. I finished up Home 7 (above) just yesterday, and I'm very happy with it and with the display in general. My work is hanging along side the work of three other Loudoun artists - Jill Evans-Kavaldjian, Karen Hutchison, and Karen Watson. The work will be hanging for the next four months, so there is plenty of time to stop in, view some art, and have a pint. Old Ox Brewery is open Thursdays - Sundays, and is located at 44652 Guilford Road, Unit 114, Ashburn, VA 20147. Stop on by. 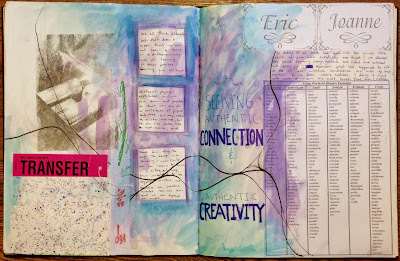 It is my pleasure to announce that David and I will be participating in 21 SECRETS in the Spring of 2015, and we will be offering a workshop called Rethinking the Page: Creating Interaction and Connection Within Your Journal. Pre-orders are being accepted right now. Not familiar with 21 Secrets? 21 SECRETS is a jumbo online workshop - it's actually 21 workshops rolled into one. So, we will be joining 20 other talented journal artists to bring you a wide range of journal techniques and a variety of inspiration! How awesome is that? 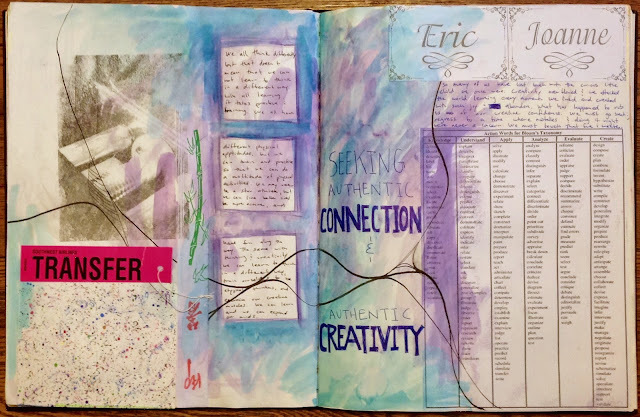 The Journal Fodder Junkies guide you through an open process that will transform your mundane journal pages into surprising, interacting, and secret filled spaces. Using an arsenal of prompts, techniques, and ideas, David and Eric take you on a journey that will have you delving and discovering, painting and writing, cutting and ripping as you transform the static surface of your pages into dynamic places filled with cut outs, fold outs, flaps, pockets, hidden spaces and secret passages. This workshop focuses on the use of prompts to guide you through a creative process that will have you engaging and transforming your pages in a whole new way. • A downloadable 150+ page eBook that contains 21 art journaling workshops packed with videos, full color photos, printouts and instructional content. • Unlimited access to all the workshops at once! You pick and choose which ones you do when and go at your own pace! There is no time limit--these workshops are yours to keep! • Membership to the private 21 SECRETS Facebook community where you can share your art work, be inspired by others, and receive warm, supportive feedback from your peers. In the 21 SECRETS community we celebrate everyone's unique expression while supporting each creative spirit to become more confidant as an artist. 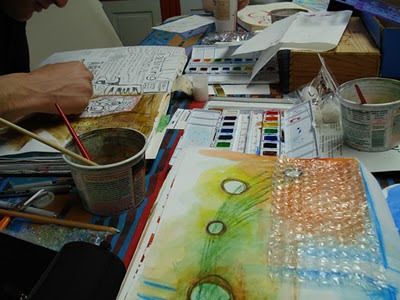 • The opportunity to learn a variety of art journaling approaches, techniques, and processes that will energize your creativity and touch your Soul while in the comfort of your own home or studio! To find out more about the artists, their workshops, and general information about 21 Secrets, click here. Note: The links that we provided are affiliate links, and we receive a small percentage for anyone registering through our links. If you want to register and support us, please consider clicking here, to take you to the 21 SECRETS website. People hold several myths and misconceptions about creativity that keep them from seeing the truth. First they may believe that creativity is linked directly to intelligence, and many people don't feel that they are particularly intelligent. Second they may believe that creativity is confined to certain fields of work such as design, writing, visual and performing art, and they simply are not a “creative”. Third they may believe that creativity is only for special types of people, geniuses, like Einstein and da Vinci, and who can be an Einstein or a da Vinci? Finally, they may believe that creativity is something that either you have or you don’t, and as such, it is a “god-given” talent and there’s no point in trying if you’re not one of the ones endowed with creativity. So, many people go about their daily lives believing that they are not and will never be creative. But they are completely wrong. Creativity is part of our original programming, and since we're lucky enough to be born into the human race, we are creative. Look at any child for proof. We see the curiosity, the imagination, the sense of wonder, and the freedom from doubt little kids have, and at one time we were all little kids. We all had that innate creativity. So what happened? In many ways we grow out of our creativity. We close ourselves off from it. Much of life seems to be about closing ourselves off and closing ourselves up. It’s sad and unfortunate, but it happens so easily. As infants and toddlers, we see the world as an immensely large place with endless possibilities and so much for us to take in and learn. At such a young age, we soak up the experiences, and we get our hands into everything as a way to explore and learn about the world. We are simply open to life and living. We trust and love without fear, but we quickly begin closing off parts of the world as we grow and learn. We close up and shut down many of the possibilities available to us in our lives mostly because of fear and pain, and we lose our creative confidence. We learn right from wrong, good from bad, appropriate from inappropriate, acceptable from unacceptable. We get caught up with doing things the “right way” and with not being bad or wrong, and we shut the door on things that don't fit with what we're learning. We get set in our ways, and we close off and fit ourselves into boxes that, many times, are defined by the expectations of others. We have to act a certain way, be a certain person, or do a particular thing. Our lives get narrower and more rigid as we learn to conform, and we lose the flexibility of youth. We suppress our curiosity, our imagination, our sense of wonder, and that freedom from doubt. Our worlds get smaller and smaller as we try to fit in, play the part, and strive for acceptance, and we don't live up to our potential. We are closed in, and often, we feel that we are locked away from our creative impulses. But every once in a while, we have fleeting feeling that we are suppose to be something more - something greater. In those instances, we long to break the confines and be different, but we feel the constraints from all those years of conditioning. We bury that creative or expressive urge with excuses, fear, and doubt, but it keeps coming back. Sometimes it becomes a nagging sense that we want to change - that we want to be free from that little box we’re confined to, but how can we break free? We are shut in, and we mistakenly think that we are locked in. But in fact, we are not - we’re not locked in. All we need to do is to start opening ourselves to the creative impulses. We need to nudge open the doors we have closed, and we need to peer behind our beliefs and our doubts. We need to open our minds and our hearts and lean into the fear and the pain. We may just discover our true selves. Once we begin the opening process, we can push ourselves and break out of our normal thought patterns. We can stretch ourselves and begin to break from that narrowly defined space. All we have to do is just be open to the uncertainty, to the uneasiness, to the ambiguity, and to the fear. We have to suspend judgement and go back to that time when play, wonder, and surprise were such a part of our worlds. We may find that we begin to redefine who we are and how we are in the world. We may discover that we're more intelligent and creative than we originally thought. We just need to be open in order to gain back our creative confidence. We can begin to see the expanding possibilities and potential of our everyday lives. We have to redefine what it means to fail, and we must learn to see that the only way to fail is to never try at all. It is fear and doubt that stops us and keeps us from ever trying. We fear judgement, failure, and insignificance. We fear rejection, discouragement, and loss. We doubt our ideas, our abilities, and our resolve. We doubt our inventiveness, our resourcefulness, and our courage. But we have so much to gain. We can grow, shine, inspire, express, open, and live, if we only have the courage to open ourselves a little bit. Slowly, we can open ourselves more and more allowing the creativity to flow stronger and stronger. Even the mightiest river begins as a trickle. It's been a very long time since I posted, but I wanted to share some of what I have been up to in my studio over the last six months. In the past I have posted about the web imagery that has taken over my work, and I am still intrigued by it and with it. But it has changed and grown since I first began exploring it six years ago in my journal. I now consider them webs of connection, and the works of art are all about my connection to the people, places, and things around me. The web is a map of the invisible forces that bind everything together, and in my latest series, I have been using maps as a basis of my work. In Home 1 (above), I googled the addresses of 5 or 6 places that I have called home, and projected them onto the 22"x30" mixed media paper. I then traced the roads and highways with pencil to create the basis of the web, and then I used acrylic paint to create the web. In Home 2 (below), I did the same thing with my wife. The next logical step was to combine the two home paintings creating a work that represents our marriage. I projected both paintings onto a new piece of paper and used purple acrylic paint. I used Golden High Flow Acrylic paint in Montana empty paint markers to apply the paint. This gave me much more control and finer detail. This resulted in a very dense web. I really like the organic, yet systematic feel of these paintings. I next wanted to create work that had a sense on depth to it, so I began using parts of the three different pieces to create layers. By cropping sections of the original paintings, I came up with separate, individual sections that I then used for each layer. I did this for both Home 4 and Home 5. I really like the depth that this creates, and it allows me to play with endless possibilities. In my latest paintings, I am once again projecting the images onto the canvas and tracing them to create richly layered pieces. I've changed up my color scheme, and I am really enjoying the pink/red/purple combo. I have switched exclusively to using the Montana markers as a means of applying the Golden High Flow Acrylic, and I find that it works extremely well on canvas. I've done a lot of other web images using random lines and webs, but I feel using the maps really imbues this work with a deeper meaning. The fact that all of these paintings are linked together, makes it a such a cohesive body of work, and a strong line of inquiry. I would love to do some commission pieces for people, as a way to visualize their connection to the places they have called home. If you're interested in setting up a commission, please contact me. The Journal Fodder Junkies are on a mission to spread the power and the creativity of the visual journal. We provide all manner of workshops, presentations, and seminars on the the visual journal and the visual arts to all those who seek to explore their creativity. Although we have primarily worked with schools and artist groups, we are looking to expand into the private and corporate sectors. We provide half day, full day, weekend, and week-long events. Prices and terms are negotiable. If you are interested, please contact us here to inquire about the services we provide. National Art Honors Society Creative Industries Studio, Washington, D.C.
UHU Jumbo Glue Stick 1.41 oz. Join Us and Get Your Journal On! It's been a busy year, and it's just getting busier. If you missed us at one of our events over the last couple of months, don't fret. We've got more in the works, so it's not too late. So, grab a journal, and join us for one of these events over the upcoming months. In May we are participating in Strathmore Artist Paper's free Online Workshops. All you have to do is register, and each week of the month, Strathmore will post a new 15 minute video that covers some of the basic ways we work in the visual journal. With registration you also have access to free instruction sheets that accompany each video. We'll also be participating in the online discussion after each video to answer any questions and give some feedback. If online workshops aren't your thing, and you want more "live and in person", then come to Ashburn, VA for our 4-day Visual Journal Retreat. Journal Fodder Junkies: The Retreat is four days of pure journaling bliss, so join us at the Embassy Suites Dulles - North/Loudoun June 26-29 for this one of a kind experience. Registration is open now, and there are Artistic Accomplice discounts for registering with a friend or two. This is the ultimate way to get the Journal Fodder Junkies Experience. Check out the retreat page for more info. At the end of July, beginning of August we will once again be in Pheonix, AZ for Art Unraveled. We will be teaching two all-day workshops as well as participating in the Shopping Extravaganza. If you enjoy the heat, sun, and sand, come join us in the Phoenix. August 1 - The Illustrate Memoir: Writing a Chapter in the Book of "You"
We hope to see you at one of these events, and please share with all of your friends and family. I've been working the last few days on a new piece in my "Home" series where I combined my two previous paintings (one that represents me and one that represents my wife) into one by projecting photos of each onto a 22"x30" piece of mixed media paper and tracing with pencil. The result was a complex and detailed web of lines. I wanted to try something different when painting, and I am still digging Golden's High Flow Acrylic. But I wasn't looking forward to painting all the small details by brush. Since the High Flow is the consistency of ink, they work in refillable markers, so I picked up a few empty Montana Acrylic Paint Markers to try. I am definitely loving the control and the detail, and I'm thinking about buying more of the markers to fill with all the different colors of High Flow that I have. I'll share more when I finish.